In the final days of his administration, President Barack Obama has commuted Chelsea Manning's remaining sentence, meaning she'll be free on May 17, or shortly afterwards. Private Manning was cuffed and charged by US military police in 2010. Three years later, she was given a 35-year sentence after being found guilty of passing on classified information to WikiLeaks – specifically 700,000 Iraq and Afghanistan battlefield reports, State Department diplomatic cables, and video of US forces killing Reuters journalists Saeed Chmagh and Namir Noor-Eldeen – along with 20 further charges related to accessing and handing over the documents. At the time, the prosecution was asking for 60 years in military prison, but the judge settled for 35. Manning also received 112 days off her sentence because a judge ruled that military prison staff had "illegally punished" her by forcing her to stand upright from 5am to 10pm every day. While in prison, she transitioned from male to female, and twice attempted suicide. After both attempts she was reprimanded and may have had more time added to her sentence. However, Obama's commutation will put a stop to that. This is not a pardon: Manning is still guilty. It simply means she'll be able to walk free this spring after spending nearly seven years behind bars. "Obama may well have just saved Chelsea Manning's life. Freeing her is clearly and unambiguously the right thing to do, and not just for the obvious humanitarian reasons, though those are absolutely compelling," said Sarah Harrison, director of the Courage Foundation – which has been battling for clemency for Manning. "Today's news will not make good the harm done on Obama's watch. Chelsea's conviction under the Espionage Act and 35-year sentence set a terrible precedent that is left entirely intact by this commutation. Who knows what Donald Trump will do with this precedent, and these powers, that Obama has left him?" The surprise move by Obama puts WikiLeaks supremo Julian Assange in something of a quandary. 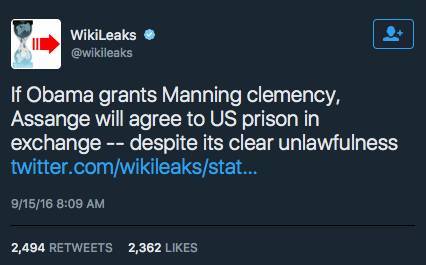 In September, he tweeted that if the US president showed Manning clemency, the Ecuadorian embassy couch surfer would "agree to US prison in exchange." Then, just last week, the WikiLeaker-in-chief tweeted another challenge to the US government. Assange promised that, if Manning was shown mercy, he would voluntarily leave his London hideout and allow himself to extradited to America to, presumably, face charges for publishing documents leaked by Manning. At the time it looked like a safe bet. Now, Tuesday's shock announcement leaves the WikiLeaks cofounder in a quandary; does he keep his word and go to America to face the music, or carry on hiding? Assange faces questioning in Sweden over allegations of sexual assault, and is hiding in Ecuador's London embassy from UK police for skipping bail. Officially, there is no extradition order for St Jules in the US nor any charges against him: Assange is the one who keeps bleating on about being dragged to America. There is an FBI probe and grand jury investigation ongoing into Assange, WikiLeaks and the publication of classified information. However, US prosecutors aren't massively keen on charging the WikiLeaks boss: doing so could result in charges against US journalists who used the Manning-supplied cables, which is a line the Feds do not want to cross. "Thank you to everyone who campaigned for Chelsea Manning's clemency. Your courage and determination made the impossible possible," WikiLeaks tweeted a few moments ago. While Chelsea Manning hasn't been pardoned, Obama did pardon retired four-star general James Cartwright for lying about leaking information. Cartwright was investigated as the possible source behind confirmation that the US and Israeli state-sponsored hackers had invented the Stuxnet virus. The malware was targeted at Iran's nuclear facilities and caused serious physical damage to the program by destroying the centrifuges used to process uranium by burning out their motors. The former Marine and vice chair of the Joint Chiefs of Staff, Cartwright denied the accusation. But he did plead guilty to one count of giving false information to investigators. He was due to be sentenced today.